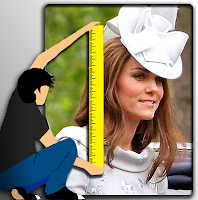 Here are some information about Kate Middleton's height. Catherine, Duchess of Cambridge, is the wife of Prince William, Duke of Cambridge. The height of Kate Middleton is 5ft 10in, that makes her 178cm tall. Kate Middleton's height is 5ft 10in or 178cm while I am 5ft 10in or 177cm. I am shorter compared to her. To find out how much shorter I am, we would have to subtract my height from Kate Middleton's height. Therefore I am shorter to her for about 1cm. And see your physical height difference with Kate Middleton. Do you feel that this height information for Kate Middleton is incorrect? What is your suggestion about the height of Kate Middleton?